STEEL FRAMED Engineered Solutions Limited is currently at the forefront of innovative steel construction in Trinidad and Tobago and the Caribbean. While the Caribbean has been slow to adapt innovative global trends in construction that utilise steel framed technology, the San Juan based company has been pushing the boundaries of roofing, residential and commercial construction in Trinidad and Tobago. “Steel Framed Engineered Solutions Limited is the foremost provider in design, manufacture, assembly and installation of cold formed steel framed solutions for all residential and light commercial construction in the Caribbean. This ranges from residential, commercial, hybrid to customised designs,” said Systems Engineer and Cold Formed Structural Specialist Consultant, Randy Persad. The common misconception is that steel structures are not as strong as concrete structures. Steel, however, has proven to be much more durable than concrete. “Cold Formed constructed structures provides exceptional resilience to earthquakes and hurricanes, ensuring the preservation of life. All structures comply to the green building code, are resistant to termites, completed in less time than conventional construction and is the ultimate alternative to conventional construction methods,” Persad explained. Persad revealed that the goal of Steel Framed Engineered Solutions Limited is to provide stronger structures that can effectively deal with the rigours of the Caribbean environment while reducing construction times. “Our mission is to promote structures for life. We build our system on the keywords Strong, Fast and Smart. I can conservatively say that a steel framed structure based on simulations and testing done will last as long as 150 years. That is more that someone’s life expectancy and that is about two to three generations,” said Persad. Steel Framed Engineered Solutions Limited has strong international partnerships and are staffed by an experienced team which has placed them as a leader in this innovative way of construction in the region. Their residential homes constructed at Welcome Estates in Cunupia easily withstood the 6.9 magnitude earthquake that struck Trinidad and Tobago recently. “We have partnered with SFS International the global leaders in structural cold formed steel systems to take full advantage of the most advanced construction system to date. This ensures that the key elements in design, manufacturing and assemble are all integrated for the highest levels of efficiency and structural integrity. Our team of high qualified engineers, specialist CAD designers and role forming experts have over 15 years of experience and training from internationally accredited bodies such as the Steel Framing Alliance, Cold Formed Steel Engineers Institute and the Steel Stud Manufacturers Association,” said Persad. 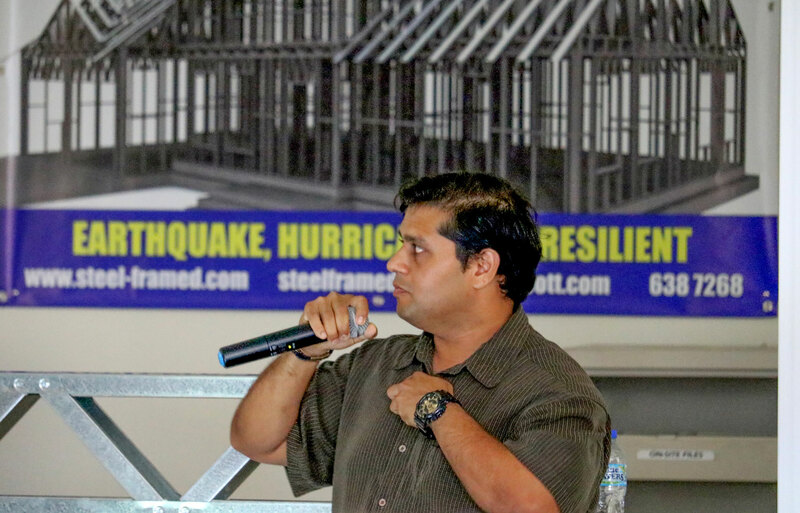 CAPTION: Systems Engineer and Cold Formed Structural Specialist Consultant Randy Persad speaks to contractors at a seminar held by Steel Framed Engineered Solutions in San Juan.